Nyagen lay some 350 kilometers away along clear, asphalt roads. Our agreed plan was for an early start and a heavy hand on the throttle, but we didn’t leave Uray until past noon. At the halfway point the sun dipped to the horizon and we stopped for gas. Clear skies meant that the temperature would fall quickly and that my glasses would freeze behind my goggles, making me completely blind. It was now −17C and Zaya bravely took over as I hid behind the sidecar’s windscreen in relative comfort. 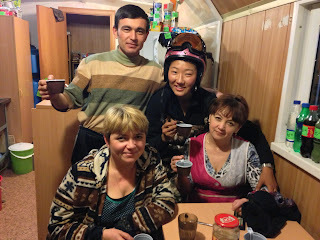 Our intermediate goal was dinner at a roadhouse another 40 kilometers up the road towards Talinka. In the gloom and the cold we drove as fast as we dared and arrived at the roadhouse in pretty short order. After we had eaten and we debated whether we should camp for the night or continue on to Nyagen. I wanted to stay, Björn wanted to go on and we went at each other for a bit. Finally, we decided to put it to a vote and the majority agreed that carrying on in the dark, freezing conditions, didn’t make much sense if all it meant was getting to Nyagen at 3:00AM. The temperature was now below −25C and Zaya sweetly started working her magic on the roadhouse’s manager, asking if it was possible to sleep in the restaurant’s warm little dining area. Lest you, dear reader, get the wrong impression, our roadhouse was the size of a single mobile home, about 8 feet wide and 30 feet long. The manager was smitten and conferred with his staff. With incredible hospitality they said, no, that we should sleep in their bunk house out back and they would sleep in the restaurant. The price? Nothing, no charge, but we are going to celebrate! At which point both Björn and I lit up, our tensions vanished and with Zaya we fully embraced the moment. The others made their various ways to bed while the three of us danced, sang, and drank ‘tomato paste’ vodka with the manager, his two ladies, and a few truckers until the very wee hours. 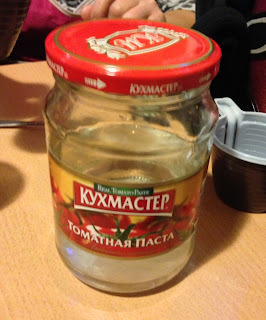 For the record, tomato paste vodka has a simple recipe: take one empty jar of tomato paste, go round back to the 500 litre barrel of vodka, fill, swill, and repeat until blotto. This video pretty much sums things up.